Combine the flour, walnuts, salt and pepper. Make a well in the center and grate in the frozen butter. Using a fork, mix everything till it resembles rough crumbs. Add enough ice water to pull everything into a ball. Knead for half a minute, then wrap in foil or plastic and chill for at least half an hour. Pre-bake for about ten minutes (at 425) till it loses that shiny look. 1/2 a large zucchini, cut into eight-inch slices. Warm some olive oil in a large frying pan over medium heat. Arrange the zucchini slices in a single layer. Cook on one side till they’re mottled with brown spots. Turn and cook on the other. It should just take a few minutes – you still want them to be bright and have a little crunch. Set on a paper towel. Put the garlic scape or garlic in the olive oil and fry lightly till it’s just brown. Put that in a blender with the basil. Put the fennel in the pan with the same oil, and lightly fry till translucent and just starting to brown. Set that aside. Add the milk, eggs, salt and pepper to the blender, and blend till fairly smooth. Sprinkle the cheese evenly in the tart shell. Spread the fennel evenly over that. Pour the basil/egg mixture over that. 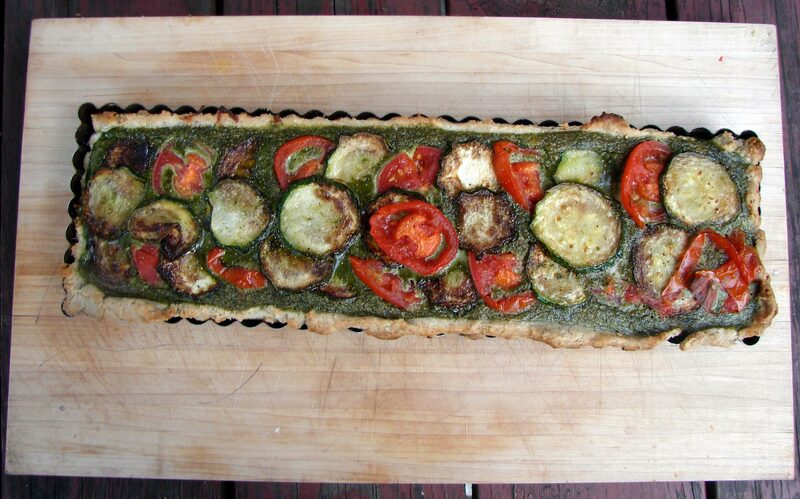 Arrange the zucchini and tomato slices prettily over everything. Bake (at 425) until the tart is puffed and starting to brown – about half an hour. Let it cool a few minutes, and then take it out of the tart pan and serve. 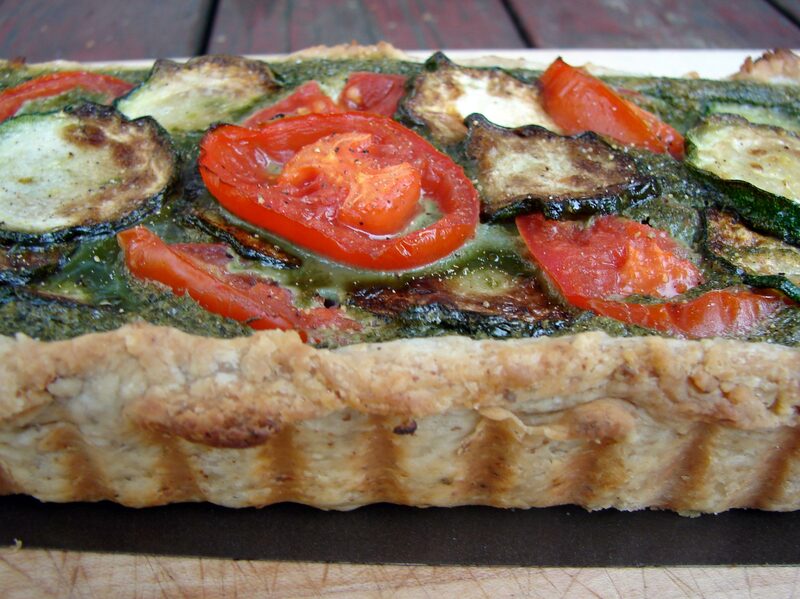 This entry was posted in basic pie filling, crust, recipe, Uncategorized and tagged basil tart, fennel, summer tart, tomato tart, walnut crust, white pepper, zucchini by Claire. Bookmark the permalink. Pine barrens? As in the Sopranos ep of that name? Wow. Possibly – I’ve never seen the Sopranos! Not even a minute of the show! I love this post! It’s yet another publication-worthy story. The tart looks most delicious and I love the tart pan, and also your philosophy on pastry crust. I also wanted to tell you and Isaac thank you for getting back to me on my question about Thimble Man. That tart sounds wonderful! I love the walnuts in the crust. 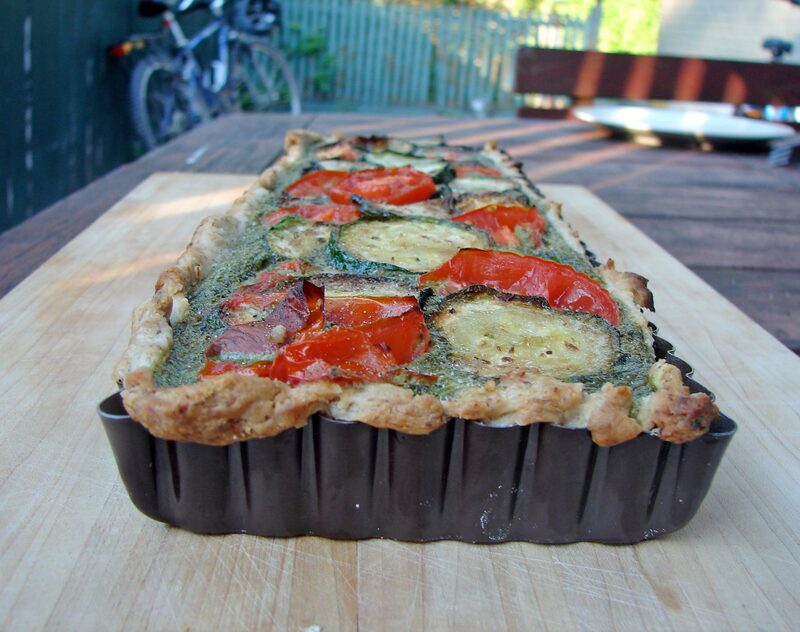 And of course it’s a perfect way to stuff oneself with all the perfect summer veg.